A member of the Facebook Group Canby Now sought to diffuse negativity with a simple post, and ended up starting a craze. If you're on Facebook, chances are you're probably a member of a Facebook Group, or 19. These groups exist for the purpose of connecting with other Facebookers to buy and sell, exchange advice, and also for your friends to try to sell you their essential oils. But at times, they can be a forum for online negativity. Canby Now is a closed Facebook Group of more than 13,000 members. Canby resident Lisa Leir started the group with one other person (whose name she doesn't remember); but that person left after two weeks, and Leir has been the sole administrator for the last three years. "The purpose of the group is to inform members of things happening in town, or surrounding areas," Leir said. "A place to post reviews, either positive or negative, a place to get to know your neighbors, and most of all a place that comes together when someone needs help." But members aren't always so neighborly, and that's why Canby Now has something of a reputation for drama. "Drama is bound to happen in any group as large as Canby Now is," Leir said. "There isn't a group that I'm a member of (and I'm a member of a lot of groups) that doesn't have drama. I feel that many other groups have a lot more drama than Canby Now does." But one member of the group took matters into his own hands when he'd had enough. In an effort to diffuse the drama on Canby Now and generate some positivity instead, Kristopher Foster began a trend centered on nothing other than a gas pump. 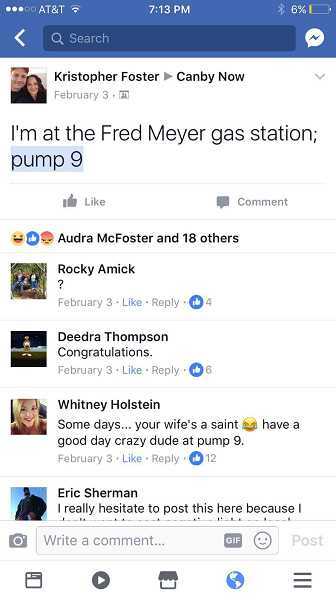 It all started with a seemingly pointless post in the group from Foster which read: "I'm at the Fred Meyer gas station; pump 9." "Towards the beginning of the year, winter time, I'm sure it had a lot to do with the extreme weather and people being cooped up in their homes, there was a lot of complaining and griping mixed with a lot of political distress," Foster said. "I, for one, was exhausted from it and one cold morning I was getting gas at the Fred Meyer gas station, which we do every day. I just happened to be at pump 9. Myself being random I made a post stating where I was and left it to see where it would take us." Foster then posted a follow-up explaining his initial post. "So what started out as something fun and random just to take that edge of negativity off, has turned into a movement," he wrote in a Feb. 23 post to the group. 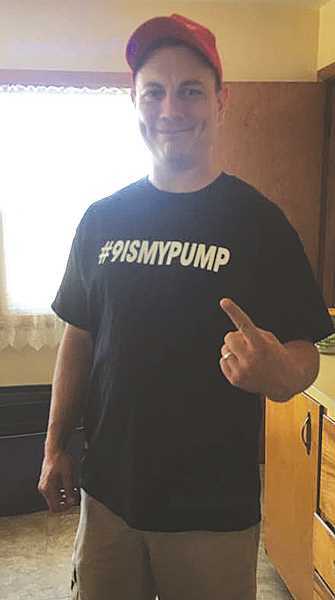 He encouraged Canby Now members to post a photo of themselves along with the hashtag #9ISMYPUMP whenever they were lucky enough to secure pump number nine at Fred Meyer Gas in Canby. People in the group had mixed reactions. Some got a kick out of it, some were confused and others were offended. But piles of people posted pictures of themselves in front of the pump. One person even traveled from Klamath Falls to have her picture taken there. 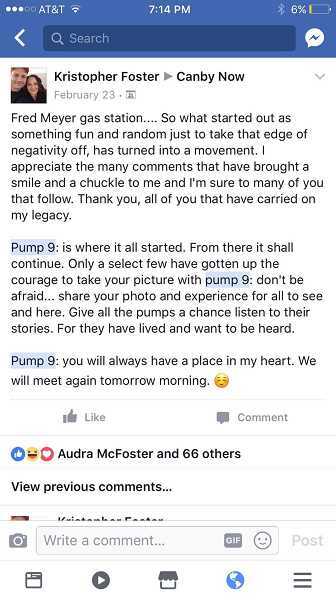 "Since then, the posts, conversations, pictures, stories and even conspiracy theories have rolled in about pump 9 and how it came to be and where it was headed," Foster said. "I never thought it would be such a huge movement as it is now." So Foster took it a step further. He went to a local business and had t-shirts made, which he has been giving away free of charge. "[I'm] only asking they take a picture and tell their story of pump 9 and how it has brought light into their lives," Foster said. The movement, as Foster calls it, has not only brought entertainment to Canby Now, but the guys at Fred Meyer gas have enjoyed watching the craze too. "An entire family, I believe it was the husband, the wife, and I think they had two or three kids. They had a good sized pickup truck. They came to pump nine, and I noticed when they all jumped out of the car, they were all wearing t-shirts that said 'Pump 9 is my pump,'" said Brandon Saddler, who pumps gas at the station. He laughed. "It was crazy! I don't really understand the whole pump nine craze, but it's brought business to our store. So that's a bonus." With a single post and the heart to bring some light to Canby Now, Foster has brought a bit of lighthearted entertainment to the community. "It has been such a fun experience," Foster said. "The people from Canby and Canby Now are so unique and accepting. You really couldn't ask for a better community."